I hope everyone had an enjoyable Labor Day Weekend. I was working- Isn't that fitting? It's a bit cooler lately and the porch is a relaxing place to be. Stop and chat for a while. You can do your own post on our "chat" using the above button, or you can just answer in comments. I read every single one. Let's meet new folks and enjoy time with ones we already know. 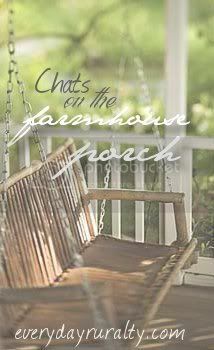 If you could bring someone to Patrice's porch to join in on our chat, who would you bring? How many times a month do you go to a library or bookstore? What things make blogs the best? I think I would bring one or both of my sisters. They are awesome ladies and I always enjoy visiting with both of them. Wendell told me I was really bad for not saying I would bring him! The horse would not fit on my porch. Pies. I love making pies, but there is this inspiration that happens when the weather gets cooler. I'm even more inspired when C.S.Farmer brings home a few bushels of lovely apples. I got to the library once or twice a week. I love bookstores, but only get to the big one in the city a few times a year. There is a quaint, little used bookstore near us and I enjoy going in there every few months. First, I think that interesting writing makes a blog. Good photography and graphics is important. I like some variety in content too. The one thing that I don't like is too much complaining. I think posting often is good, but I understand that there are many other things that need attention in our lives. I'd probably go back to pottery class. I took two years of it, about five years ago, and loved it. I found that I'm much more of a sculptor and hand builder than a wheel potter. I miss it. I think harp lessons would be uber cool! Have a week that makes you smile! I love decorating with pumpkins in the fall. I guess that doesn't really count as making something, but still my favorite fall activity. i would sit with my mother on the porch. but i wouldn't join in with chatting with anyone else then. i'd keep her to myself (she's been gone 7 yrs this week). i don't go to the library at all. i don't read, really. my favorite thing to make in fall is a fire. this year that won't be possible due to the drought and burn bans. i like photos and stories but too much chatter makes me skip ahead. Wow, already Wednesday. Really pottery, that amazes me. I am so glad you like books, bookstores and used bookstores, we would have such a fun time visiting on your porch. I like that you like to make pies too. It is so nice to read through your list. Because of my slow typing ability I'll just answer your questions here. 1. I would take Kim of My Fields of Dream and Kim of Millie's Mat to your porch and I would bring a wagon full of books for you and your porch guest as I love books too and have so many. 2. I love making soups. 3. I go to the library in the winter but I go to Value Village thrift store every couple of weeks and they have thousand of used books all categorized and I always buy more than I have time to read. 4. Good humor, good pictures, interesting everyday stories, easy to read large font and paragraphs that are spaced so I don't give up reading. An easy on the eyes background. Dark background are so difficult on my eye. 5. I would like to take all levels of touch healing and it is a long process. I only have level one and would have had to go to a larger city to take the rest. 1. Interesting, like TexWis Girl, my first thought was to bring my mom, who also left us 7 years ago. 2. Fall inspires me to be crafty. I guess the cooler weather lends itself to being indoors. I love fall colors, so would incorporate them in whatever I make. Last year I made a lot of greeting cards... not sure what I'll feel like doing this fall! 3. I shop online at Amazon quite frequently. I got a Kindle for Christmas, so I've been buying books for that. I spend far too much.. it's too easy to buy the books that way!! I've just discovered the library in our new town... and love it. In the past month I've been there twice. 4. I like pictures and clever plays on words. I like to read about people who are doing things I enjoy doing. I like humor. 5. Oh wow... there are so many things I want to learn. I think I'd like to take a course in painting... a long course so I could go from basic drawing to working with water colors and acrylic! A day late and a dollar short...that's me!! ;-) Thanks for letting me join in!